As if answering the president's proclamation, Pepperdine University announced that same year plans for a new School of Public Policy that would focus first not on the federal government, but uniquely embrace President Clinton's further conviction that "we know big government does not have all the answers." He added, "Smaller government must work in an old-fashioned American way, together with all of our citizens through state and local governments; in the workplace; in religious, charitable, and civic associations [and] with stronger families." When, with strong bipartisan cooperation, President Clinton signed the Welfare Reform Act to reduce federal micromanagement of the affairs of the institutions of civil society, his intention and Pepperdine's coincidental initiative in some ways represented a rediscovery of America's historic associational life, observed earlier in Tocqueville's 19th-century visits. Some have called it "American exceptionalism" because it is seldom evident in cultures suffering periods of moral exhaustion when the temptation to centralized totalitarian control may be strongest. The reality voiced by President Clinton forced many established public policy schools—noticeably concentrated in the Boston to New York to Washington, D.C. corridor—to suffer a kind of identity crisis. Conceived with noble intentions to populate the huge federal welfare bureaucracies spawned in the 1960s, their "Great Society" programs had demonstrated a disappointing capacity to violate the well known dictum of the Hippocratic oath: to "do no harm." Since for the man with a hammer every problem looks like a nail, many public policy professors, following their training, were still inclined to seek solutions first through the revolving door of Washington. At about the same time social scientists, including Nobel economist Gary Becker and sociologist Robert Putnam, were popularizing the importance of "social capital." In the 18th and 19th centuries economic capitalism, avoiding the old superstition that one person gained only at another person's loss, had created a "larger pie," permitting whole new segments of humanity to escape the filth of rural hovels and high infant mortality that had been accepted as normal for centuries. The more recent concept of "social capital" demonstrated further how the resources that citizens access through the various voluntary and social networks, on which Pepperedine's public policy program has focused attention, is even more critical than the economic wealth created by the Industrial Revolution. 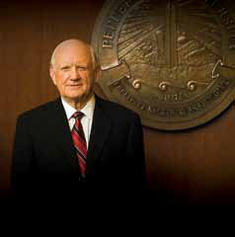 Building on the emerging interest in social capital, with its recognition of the considerable value of such intangibles as trust, Pepperdine's program focused on a subset of social capital that some have called "spiritual capital," designing a series of annual signature conferences and publications under the rubric of "Faith and Public Policy." It turns out that just as government expenditures can soak up the oxygen supply of available financial capital, thus starving the private sector's ability to create jobs (a temptation recognized by all economists), so federal welfare programs, driven by the professionally credentialed "experts" so lauded by the Progressive Movement, demonstrably could damage the spiritual capital traditionally fueled by the mediating voluntary associations between government and the individual. Thus, with broad and deep bipartisan support, America's faith-based and community-based programs have demonstrated a form of spiritual capital that is far more effective than entitlement programs mired in professional bureaucracies. A convincing example of this was discovered by a group of Pepperdine public policy students who devoted considerable time on the Gulf Coast gathering data about how churches reacted to Hurricane Katrina. Their findings, the basis for one of the school's Faith and Public Policy conferences, found that while the failures of government following Katrina preoccupied the press, scores of religious congregations were on the ground in Louisiana ahead of the Federal Emergency Management Agency (FEMA). Without a coordinating headquarters, autonomous congregations of Churches of Christ effectively used Web-based social networking to activate an entire brotherhood. The Southern Baptist Convention mobilized 3,000 people to feed 300,000 people each day. One Houston congregation assembled 131 faith-based organizations, including Jews, Muslims, Protestants, Catholics, Buddhists, and Bahaists, whose division of labor would have been the envy of an invading army. Virtually overnight a quarter million evacuees were placed in Houston homes and schools. Pepperdine discovered a half a century ago that no institution, especially one whose humble faith runs deep, ever attains greatness by imitating others. And its youngest school, arriving at the right time, has also chosen a path that is unique among schools of public policy. By replenishing the spiritual capital of the intermediary institutions of civil society, it has turned to those who have an intimate knowledge of the geography and sociology of the regions they serve that would require a lifetime for government officials to begin to understand. As President Clinton observed, the era when, with credibility, big government could be seen as the answer, is over.